1. In a large bowl, combine all the ingredients apart from the pecans. Cover and leave to soak for at least 3 hours or overnight in the fridge. 2. 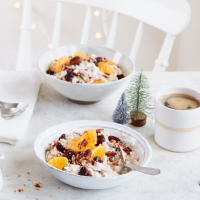 When ready to serve, divide the muesli between bowls with the toasted pecans, extra dried cranberries and clementine segments scattered over.